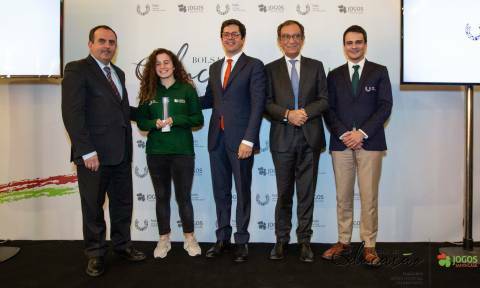 Margarida Alves, 4th year master's student in Chemical Engineering and Biochemistry, at Faculty of Science and Technology of the NOVA University Lisbon (FCT NOVA), member of NOVA futsal team that won the bronze medal on the podium in the World University Championship of Futsal 2018, won a schoolarship from University Sports Academic Federation and Games Santa Casa. The two institutions have gathered to recognize the efforts and talent of ten young people who throughout the course of 2018 have proven that it is possible to follow a parallel path of success. The award-winning athletes stood out in the world championships of the past year, with the achievement of medals and prominent positions in the respective modalities.